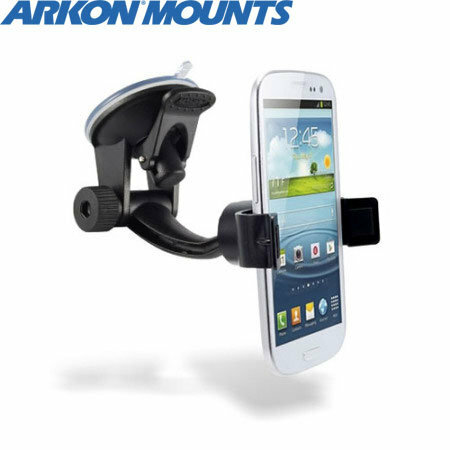 The device stays attached to the screen, which is more than other suction mounts, however to get your phone in the spring requires 2 hands because the spring grip is rather strong. I am more than happy with this version, having had several different makes which have been abandoned for negative attributes not afflicting this model. This is a great product - it holds my phone snugly and since it's mounted on a ball joint, it can pivot between vertical and horizontal without having to take the phone out of the cradle. The lever lock for the window attachment works very well and can be fitted easily. Good product but works best attatched direct to windscreen, my dash is curved so not so good on such a surface. But other than that, this is my second Arkon product. Satisfied with both. Is not good. Too small for sony xperia Z1. I have to say I am mighty impressed with this little trinket, it isn't had at all for the very little cash... you can rotate it anyway you want and it grips the phone nice and securely and hasn't fallen off the windscreen once! It comes with an adhesive plastic plate that you can stick on your dash rather than using the windscreen if you wish as well. The HD7 is slightly wider than the average mobile, so careful scrutiny was required to ensure this device would be capable of holding the HD7. Clearer info regarding the device capability in terms of width & depth it can hold would be useful. Also, the arm is not reversable, so thumbscrew can be in difficult position to operate. The item is exactly as described and does exactly what it says it will. Delivery was prompt and this is a great price for a great product.